Before you can send an SMS Landing Page, you must first have created a template. If you haven’t yet done this, here’s a guide to creating a Landing Page template. Next, click on the Send a Message option from the menu on the left side. 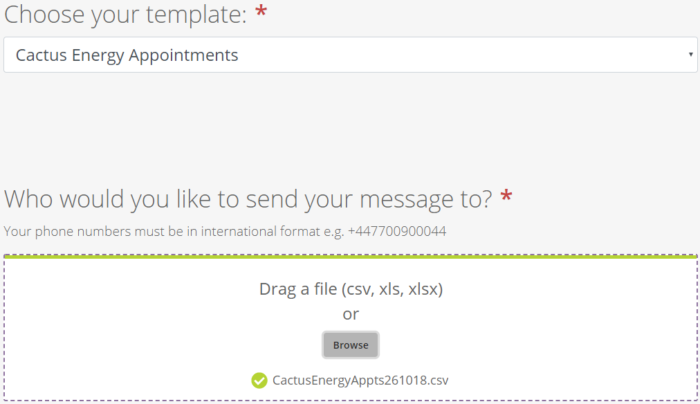 Choose your template from the drop down menu. Next, upload the file to whom you’d like to send the message. The only column of data that this spreadsheet needs to have is the mobile phone numbers of the recipients, and they should be formatted in international format – e.g. 447870154769 for UK numbers. Additional guidance on data formatting is available here if needed. 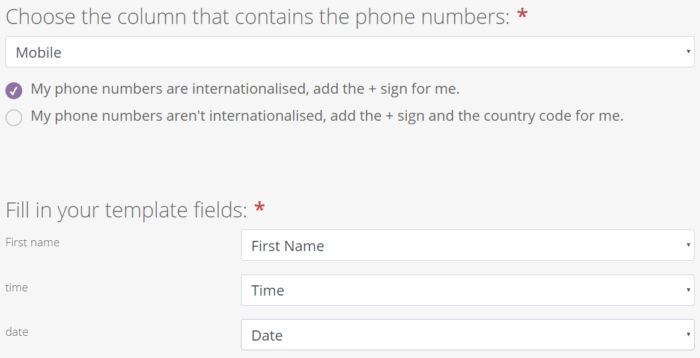 You can upload additional columns of data if you want to add personalised fields to your SMS Landing Page. If there are multiple columns, the next screen will ask you to identify which column includes the mobile numbers. Once identified, you’ll see a radio button selection for how the data should be formatted. At this point, if you didn’t add the ’44’ prefix to your messages, the system will add it automatically if you select the second option. If your Landing Page template included additional merge fields, you’ll also be asked to map your spreadsheet columns with these fields on this screen. 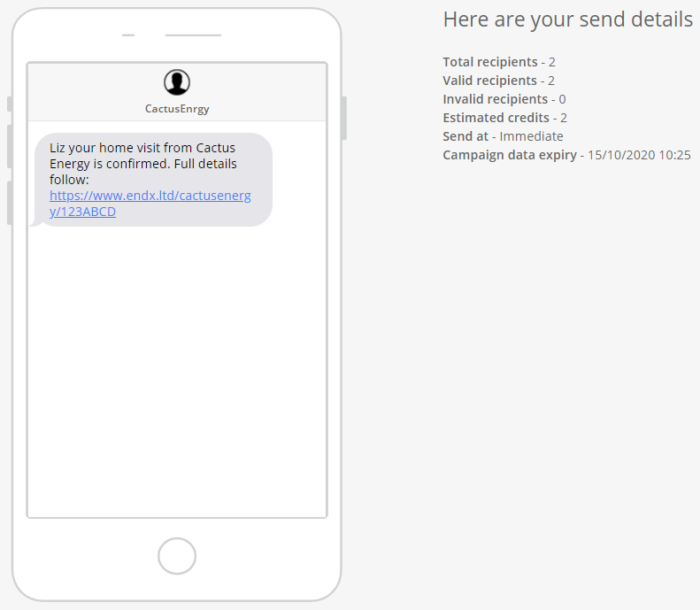 You can find out more about personalising your SMS Landing Page here. Next, you’ll be asked to name the campaign and the sender of the message. If you completed these fields when you built the template, they’ll be pre-filled in here; if not, you can add them now. If you wish to receive replies, the sender needs to be a virtual mobile number or short code (read more). 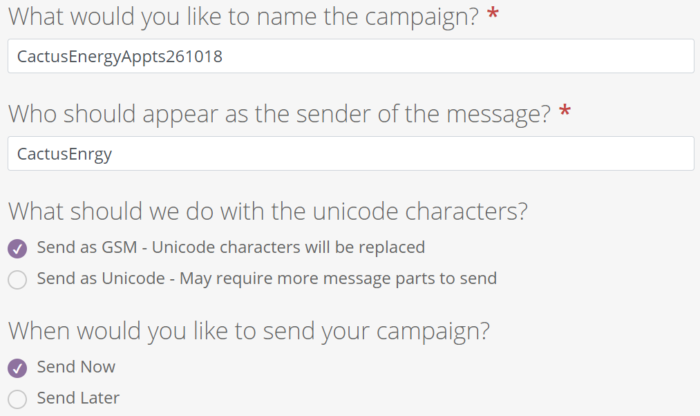 If you are intending to include emojis or special characters in your message, you will need to send it as Unicode (read more). You can send now, or select a date and time in the future. These are all options that you can make at template level, and if you did, they’ll be pre-filled here. If not, you can add them here. Here you can set an expiry date, after which, the landing page will no longer be available. You can also set a date by when you’d like all campaign data to expire – this is to assist with data security, and aids compliance with GDPR. Click Next – your message will not send immediately! You have a last opportunity to review how the SMS will be viewed by customers, complete with any personalised fields you included in the SMS. If everything looks good, click Send. 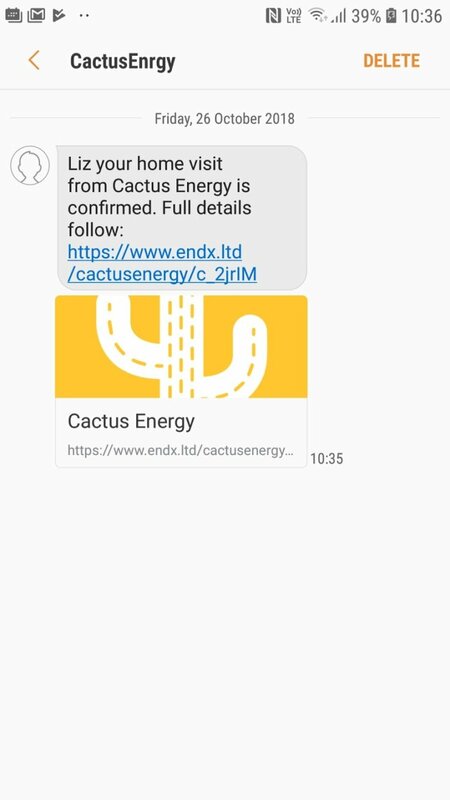 You’ll be returned to the homepage, with a message appearing to the bottom right to confirm that your messages have been sent.